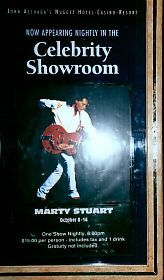 Sheila Walters from Wayneville, OH flew to Sparks, NV to see Marty perform three shows. She shares with us her experience and photos. Well sit back, take your shoes off get cozy, this is gonna be long! It was the ultimate Marty Party, an absolute fabulous time I will NEVER forget! Are ya ready? Sat. Day 1.... Left for the airport at 6 a.m., beautiful day to fly, saw the arch in St. Louis, The Great Salt Lake. The salt flats where they test drive cars. The Snake river all clear as a bell. Arrived in Reno at 12 noon. Got off the plane, walked around the corner and there was a sign 4x5 feet of Marty! Had show times and dates-- what a way to start my day! 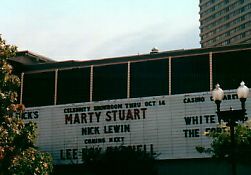 Took a cab to the hotel and on the way a HUGE, 50 feet across at least, billboard of .... you guessed it, MARTY! This just keeps gettin' better don't it? Checked into the hotel, very nice, rooms were French country decor. Went down to get tickets. Had Saturday and Monday booked;was told Sunday was not available--a Burger King convention bought it out; was told maybe I could get balcony, I took it. The gal said line up about 6:30 the show starts at 8. It was maitre'd seating so a little grease in the palm would be needed to get a good seat, my money was ready. It was only about 1 p.m. so I had plenty of time to explore. The pool area was really beautiful and there were lots of restaurants to pick from. I decided to play a few slots, (maybe get a little extra Marty money) walked up to a slot put in $3 hit the button ...nothing. Tried again. $3 more, hit the button.... bells started to ring and whistles began to blow, JACKPOT! $500 there was no stopping me now, I had lots of grease for the palms! I decided to get in line about 5:30. Already 5 people in line. I noticed two gals at the front of the line looking at me and one walked over and asked if I was Sheila. it was Heather and a friend of hers, Dee. Heather moved me to the front of the line pronto. Things were really startin' to look up. Heather said there was not usually a meet and greet there but she had said something to Steve (they are buddies) about how far I had come would he see if they could have one but she wasn't sure. I was thrilled to just be there; anything else was a bonus. They seated us at about 7 at table 61, right up front at the stage, maybe 10 feet from where Marty would stand. Heather's sister Leah and another friend Deanna had joined us and the 5 of us were ready! The show started at 8 with two elephants, Bertha and Angel doing their thing. You had to cover your drink or you would get elephant goobers in it. If they would have stretched their trunks out they could have touched our nose. They were way to close! Next came a comedian/magician who did a few cute tricks and some lame jokes. The lights went out and they announced, "Ladies and Gentlemen...MARTY STUART!" The guys came out in black tees and jeans with their sparkly jackets. Marty looked GREAT! He wore black leather pants, black shirt with red rose buds up the lapel and the black jacket with red horseshoes. He hollered "HOWDY!" and just went nuts, singing, picking, and dancing. He did, "Doin' My Time," "Red Red Wine and Cheatin' Songs," "Tempted," "Burn Me Down" and "Country Girls." Someone handed him a note wanting him to wish this lady a Happy Birthday. He asked where she was and how old she was. She told him she was 80 and she wanted to know if he would sing "Red River Valley." He said "Will ya give me $10 if I know it?" and promptly sang and played the whole thing! He said he had gone for a walk that afternoon and ran into a street person,"and ya all know I LOVE hobo's and bums." The guy said "Hey for 5 bucks I'll tell ya the funniest joke ya ever heard." Marty said "Well I can't pass that up." He gave him 5 bucks and the guy said "Do you know what President Clinton regrets most about his affair with Monica?" Marty said "no" the guy said "Give me 2 more bucks and I'll tell ya!" Marty had to know so he gave him the 2 bucks and the guy said "That he didn't have Ted Kennedy drive her home!" The crowd liked that. He did a couple more songs, "Only Daddy That Will Walk the Line," "Southern Accent," "Reasons," "Now That's Country" and "This Ones Gonna Hurt You." His voice cracked a little and he said he was having a little trouble so he asked for some hot tea and said he'd just pick a little. He did "Marty Stuart Visits The Moon," and "Can't Help Falling In Love," and everybody sang along, He did "Oh, What a Silent Night" and "Hillbilly Rock" and said "goodnight, see ya tomorrow night." He walked along the stage shaking hands and he flipped his pick to Heather. The crowd just screamed and clapped so he came back out for an encore. He did "The Whiskey Ain't Workin" and "Hey Baby." That was it, He was FABULOUS!!!! Then they announced a Meet & Greet. He Did It!!! There were only about 12 people so we stayed toward the end. I was so excited! I walked up to him and he said "Howdy! How far did you come?" and I said "2,500 miles" and he and Mike both said "Is that all?" and I said "Yep that's all" and Marty gave me a Big Hug and said "I LOVE YOU." I about DIED! Then he asked me where I was from and how long I was staying I told him I would be there Sunday and Monday and he said he would look for me! I had Sherry's newsletter and the program she had sent me from the photo exhibit in my hand and he wanted to know what I had so I told him and he said "let me see it," so he took it and stuck his head around the corner and told the others they would have to wait he had to read something and did! He said "Boy that Sherry knows more about me then I do!" I said "yep and she tells us." I said "Sherry is the BEST and he said "she sure is." Way to go Sherry! Then he signed it and the photo program and gave me ANOTHER HUG!!!!! Then Mike had to do his job and move us along. Well I can not tell you how great Marty made me feel, words just don't cut it! We left and went to get something to eat. Heather had told Steve where we were going and he met us there. We had a great time. He was so nice and friendly! I told him Hi for Jamie, they're buddies too. I told him we were going to Athens but we all know what happened there and he said Pam Tillis canceled it. I asked him what they do all day away from home so much and he said they take walks and go to the work out room and he and Gregg had gone to a movie that afternoon and saw the new Robin Williams release. He said that if a town is known for something special like a park or something like that, they would go there. He said that there wasn't much to do in Sparks. We talked a little longer and then left. It had been a long day for me. I had been up 24 hours at that point, so I went on to my room. This is really LONG so Tomorrow Day 2!